I made a discovery in Jamaica. It could be the most effective way to fall asleep faster and stay asleep longer. At least twice a year, I leave the clinic to travel the world, looking for medicinal herbs and plants that may help my patients. I went to Jamaica to visit my herbalist friend Ivey Harris for a book on Jamaican herbs I was writing. Our group pushed through a sparsely inhabited area high in the eastern John Crow Mountains. After hiking for five hours, we settled near the base of a waterfall and pulled lunch out of our backpacks. 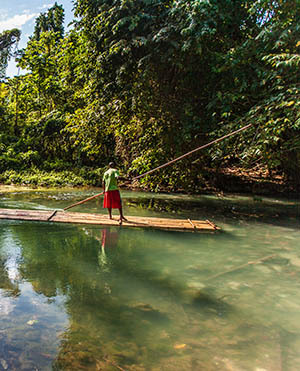 The men paddle their boats out, crumble up some dried leaves and bark, and then throw them into the water. A few minutes later, fish start to float to the surface. Then the fishermen scoop up the fish and return to shore. My guide explained the leaves and bark are from a tree that grows wild all over the island. The bark’s medicinal qualities temporarily calm the fish, causing them to float. Jamaicain Dogwood calms your mind so you can drift calmly into sleep. This bark, called Jamaican Dogwood, makes it much easier to both FALL asleep, and STAY asleep. It also helps to calm the “racing thoughts” or “worried mind” that keeps you up at night thinking and fretting about every little thing. Today, I’ll show you how Jamaican Dogwood, along with a few other “sleep secrets” help to calm your mind, eliminates tossing and turning, and helps you get the most satisfying and restful sleep you’ve had since you were 6-months old. Sleep is still a mystery to modern medicine and it’s not a required course in medical school. I bet your average psychologist knows more about sleep than your doctor. And that’s not good news for you. While your doctor has good intentions, there’s a 99% chance you’ll get a prescription for a sleep drug and be sent on your way. And don’t bother asking about how to calm your thoughts, or feel more relaxed when you’re staring at the ceiling at 3am. They won’t have an answer. I don’t believe sleep drugs will help you in the long run. And who wants to feel like a zombie when you wake up? There’s a better way to help you FALL asleep and STAY asleep during the night. Second, key minerals help to stimulate the areas in your body that regulate sleep. Third, with the help of a new “delivery technology,” you can reset your natural sleep cycle, making it much easier to both fall asleep and stay asleep… WITHOUT the anxiety or tossing and turning. This all-natural formula, which I call Native Rest, is behind the success stories you’re reading about in this letter. Native Rest restores your body’s natural ability to sleep peacefully at night. Many people describe Native Rest with words like “Godsend” and “Savior,” but to me there’s no “magic” behind it. The way it works is well documented and easy to measure. Just ask Kate. Here’s part of an e-mail she wrote to our customer care team. “There are times I just feel really wired at night. It’s like my brain can’t shut off. I’ll try reading, watching TV, I’ll even get up and start cleaning the house. When it gets to that point, nothing seems to help. I just seem to get my second wind at the wrong time, and when I’m up at 3 AM I get stressed out because I know I have to get up early. Traditional Chinese Medicine (TCM) has a history 5,000 years old, so it should come as no surprise Chinese doctors have perfected ways to help you sleep. One of the most effective, the jujube fruit, is prescribed regularly for tension, nightmares, night sweats and sleeplessness. And like most Chinese medicines, there are modern studies to confirm their effects. Today, we know an extract of the jujube fruit works by affecting an area of your brain called the hippocampus. The hippocampus is located in the middle of your brain and is one of your brain’s emotional centers. Jujube fruit acts to relax your hippocampus which helps your mind relax and calms your emotions. It works especially well for people who lay awake thinking or worrying. 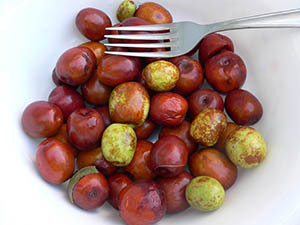 Jujube fruits may be the “switch” that helps you “shut off” your mind at night. Taken in combination with Jamaican Dogwood, Native Rest helps you relax and settle down to a good night’s rest. But relaxation and a calm mind is just one part of the equation. There are key minerals that help you sleep and those need to be present in just the right amounts. Selenium is a trace mineral that protects your cells from free-radical damage and supports your immune system. It also helps regulate your thyroid. That’s key because in addition to other functions, your thyroid affects how well you sleep. If your thyroid is too active or sluggish, you’ll sleep less or have a hard time getting to sleep. You may lie awake with your mind racing, wake up several times throughout the night, or wake up in the middle of the night, unable to fall back asleep. If you are having sleep concerns, you may be low in selenium. Zinc is another sleep mineral you may have too little of… it’s key for producing your sleep hormone called melatonin. Zinc used to be in our soil but these days it’s hard to come by, thanks to commercial farming techniques that practically sterilize our soil, leaving it with almost no minerals to be taken up by the fruits and vegetables we eat. I added both selenium and zinc to Native Rest to help you sleep at night. And that extra zinc is essential for fixing the final problem with your sleep cycle: melatonin. You’ve probably heard of melatonin. It’s the hormone your body uses to regulate sleep. But if you’ve tried melatonin before and felt disappointed, don’t worry… that’s common. There are two problems with melatonin that most doctors overlook: 1.) The dose needs to be much smaller than most people realize, and… 2.) Taking melatonin as a pill will not make it past your gut. In other words, it won’t be absorbed and it won’t work. During my research for Native Rest, I discovered a solution that makes melatonin MUCH more effective… and a LOT more convenient. But first, let me show you how critical melatonin is to your sleep (and your sanity). You have a “body clock,” which is actually a cluster of cells located in the hypothalamus, near the back of your brain. It governs the release and timing of most mood, energy and sleep related hormones. As day turns to night, your body starts to decrease your daytime hormones like serotonin, adrenaline and cortisol. And under normal circumstances, your body releases melatonin at the end of the day when you’re ready for bed. That sends you off to sleep. But when you don’t have enough melatonin, your daytime hormones release early… waking you up suddenly and for no apparent reason. When that happens, getting back to sleep is next to impossible. And when your melatonin levels stay low over time, waking up in the middle of the night becomes a habit. A study from the Massachusetts Institute of Technology (MIT), found that melatonin taken before bedtime helped people fall asleep faster with no “hangover effect” the next morning. Another MIT study looked at the effect of melatonin replacement for people with low melatonin levels. Melatonin taken before bedtime brought their levels back to normal and fully restored their sleep efficiency. Researchers at Tel Aviv University confirmed melatonin’s effectiveness, especially for people over 50, by finding that melatonin helped them fall asleep faster and decreased the time it took them to “wake up” in the morning. Zhdanova IV, et al. Effects of melatonin before habitual bedtime. Sleep. 1996 Jun;19(5):423-31. Zhdanova IV, et al. Melatonin treatment for age-related insomnia. Journal of Clinical Endocrinology & Metabolism. 2001. Vol. 86, No. 104727-4730. Zisapel N. The use of melatonin for the treatment of insomnia. Biol Signals Recept. 1999 Jan-Apr;8(1-2):84-9. By the time you reach middle age, you have less than half the melatonin you did when you were in your twenties. And the older you get, the more likely you are to suffer from some kind of sleep disturbance. Low levels of melatonin mean you’ll have a harder time falling asleep. You’re also more likely to be a “light sleeper” and wake up sooner without being able to fall back asleep. But that doesn’t mean you need drugs to fix the problem. You can reset your body clock and get a good night’s sleep just by giving your body the right dose of melatonin. What’s more, melatonin doesn’t stay in your blood like sleep drugs do. That means by the time you wake up in the morning, the melatonin you took before bed is completely out of your body. No hangover, no daytime grogginess and no drain on your brain cells like you get from sleeping pills. This last point is worth repeating. Melatonin can help you kick the sleeping pill habit. I’ve seen it work with my own patients. By taking regular low doses of melatonin, you can wean yourself off sleeping pills and rebalance your natural sleep cycle. As I mentioned, you need a very small dose of melatonin to trigger the natural changes that help you sleep. If you take a little too much, you lose some of the benefit. And if your dose is way over the mark, you won’t get any sleep benefit at all. But melatonin at the right dose is remarkably effective at restoring your sleep cycle. There are literally hundreds of clinical studies to back this up. Some of them I already shared with you. It’s a matter of knowing how to use the tools you have. At my clinic, I’ve been working with sleep disorders for years now. And low-dose melatonin is by far the best way to help people who can’t sleep. With Native Rest, all you need is a few sprays. That’s it. Quick and easy. Native Rest is a convenient spray. It’s about the size of a breath freshener. Just a few shots before you’re ready to go to bed and you’re set. And that’s good… because with pills you have to take them up to an hour before you go to bed. And that can be hard to judge sometimes. Taking melatonin in a pill form slows down absorption and kills off its effectiveness. Before it gets a chance to work, the pill form of melatonin mostly gets destroyed in your gut. And by the time it gets through, what little is left is not usually enough to make a difference. Even if you could maintain total absorption, (which you can’t) you’d still have to estimate when you want to fall asleep and then take the pill at just the right time. But my unique spray delivery bypasses that whole process. Just a few shots under your tongue and the melatonin — along with the other herbs and minerals — enter your bloodstream in a matter of seconds. No need to predict when you’ll want to fall asleep. And no waiting around for it to start working. I use Native Rest with my patients, and since I added the Jamaican Dogwood and Jujube fruit my staff and I have EXTENSIVELY tested the new formula. So far, the results are just what I expected: Safe. Effective. Reliable. Many tell me they’re more relaxed and energetic, and relieved their sleep problems are under control. And they love the fast-acting, portable spray. It takes away the guess work. Getting started is easy and RISK FREE. You’re always covered by my NO HASSLE guarantee. This gives you the opportunity to try Native Rest with no worries or regrets. I want to give a solution to your sleep concerns. And that’s not always possible when you shop at your local vitamin store. So if it doesn’t work for you, it’s never a problem. Just return the bottles within 90 days, and they’ll refund your credit card for the FULL amount. 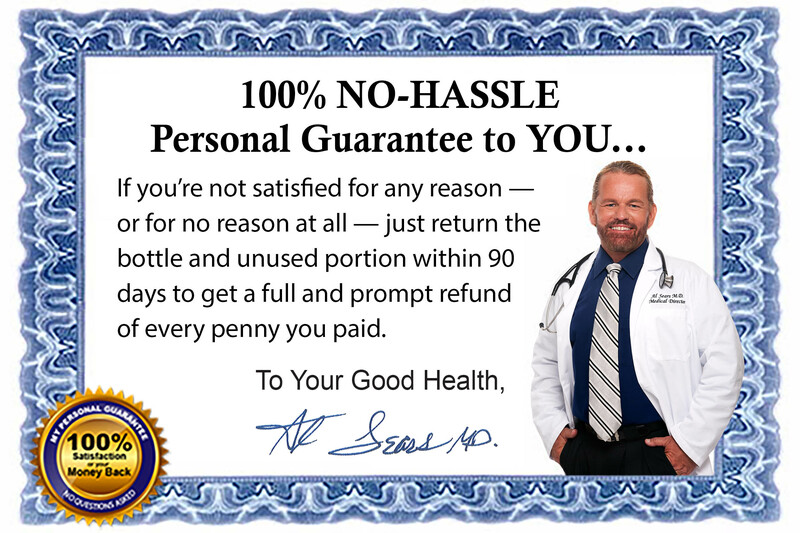 You get a full refund when you return the bottle — even if it’s empty! To get your own Native Rest experience just click the link below. P.S. – Native Rest is an easy choice. I use it myself and recommend it to my patients. But to help you get restful sleep AND the most from your waking hours, I want you to read my special report Repair, Refocus and Recharge Your Brain. Let me hear from you today and it’s yours FREE. Sidestep These Brain Busters: Get the most out of your brain for as long as possible by eliminating these brain-sabotaging “danger foods” along with the single-most popular (and harmful to your brain) prescription drug in medical history. Supercharge Your Brain With The Foods You Crave: Find out why your brain craves whole, fresh foods and which ones you should eat the most. Revitalize Your Brainpower: Neutralize your brain’s worst enemies with a little-known “primary antioxidant” and its surprising partner. Repair Your Brain With 7 Nutrients You’ve Never Heard Of: Ramp up your brain performance to new level with 7 nutrients your doctor will NEVER tell you about. Recharge Your Brain’s Signals With Nature’s Pharmacy: These 7 natural antidotes will eliminate forgetfulness, brain fog and lapses in concentration. Plus, discover Einstein’s “secret advantage” and how to enhance this part of your own brain. Refocus Your Mind And Stay Ready and Full Of Energy: How to take back your brain from the modern world and overcome the stresses of modern life by getting more oxygen and blood to your brain in just a few minutes a day. Build A Better Brain Starting Today: How you can train your brain to speed through problems and operate at its best with mind exercises, games, getting the most out of your senses and other fun mental challenges. Just click the link below and I’ll send Repair, Refocus and Recharge Your Brain straight to your inbox RIGHT NOW. No waiting on the post office. But don’t wait too long. This is a limited time offer. Repair, Refocus and Recharge Your Brain retails for $19.97 and won’t be a freebie forever. YES, Dr. Sears! I want to turn off my restless mind, fall asleep fast, and stay asleep naturally without a prescription. I’m ready for the best sleep of my life with Native Rest! I’ll save 33% by joining the Native Rest VIP 3-month Auto-Delivery Program, which includes a locked-in discount (3 bottles for the price of 2…that’s a FREE bottle) and FREE Shipping for Life. I’ll get 3 bottles of Native Rest shipped right to my door every 3 months for just $47.90. And I will get this discounted price along with FREE shipping for as long as I take Native Rest. Order a 1-month supply of Native Rest for just $23.95 plus $8.95 shipping and handling. 1 Cajochen C, et al. Role of melatonin in the regulation of circadian rhythms and sleep. J Neuroendocrinol. 2003 Apr; 15(4):432-7.